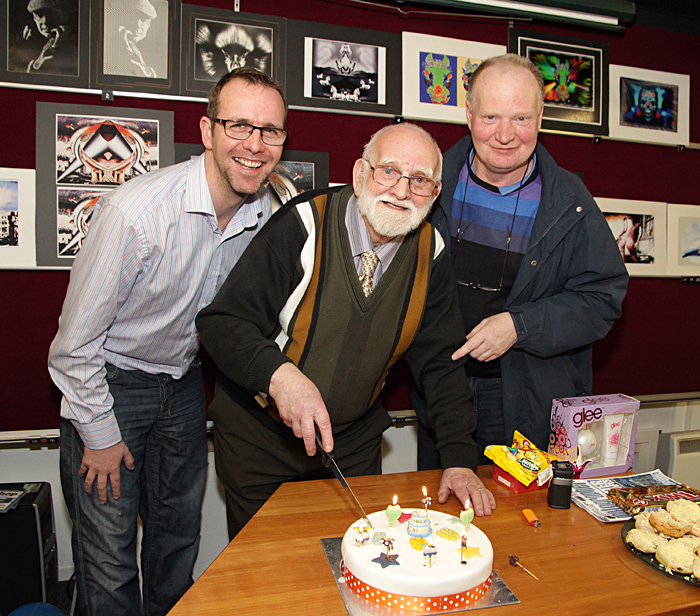 Friday evening was “Sinclair Adair” evening at Ards Camera Club as members celebrated the 90th birthday of their oldest member. David 'Sinclair' Adair has been recognised in the Northern Ireland photographic field for most of the last century and has been involved as an amateur and professional. He is still recognised at an international level and showed us some of his certificates from across Europe. Lately he has developed a unique style using the latest developments in post production digital techniques and members were delighted to see his creative and stunning audio visual presentations. This was definitely an intergenerational evening as new and younger members learnt from a very experienced master. Members were also invited to try the “Sinclair” technique and he provided constructive comments and awarded prizes for our efforts. Surprise visitors on the evening was Sinclair’s son Sinclair 'Rusty' and grandson Robert (in picture). The evening was such a success that we will make it an annual event! Friday 14 February - There will be an appropriate look at romantic photography , to coincide with Valentine’s Day. 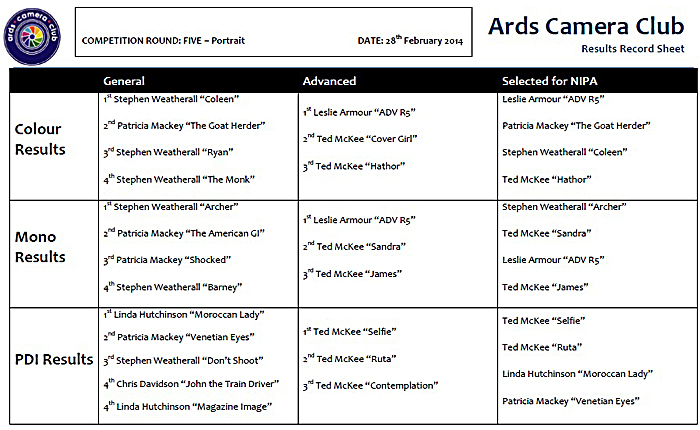 Ards Club Competition - "Best of Ards"
Members celebrated the “Best of Ards” at the Camera Club last Friday evening in more ways than one. There were a few eyebrows raised when this was suggested as a topic for a competition evening but members threw themselves into the theme and could be seen wandering through Ards looking for unusual viewpoints and angles to try to get the winning shot. The final collection of weird and wonderful shots provided a real learning opportunity for our judge, Paul Hanley LRPS, to point out what makes one photograph stand out from the others. One man has definitely mastered this as Ted McKee provided 5 out of the 6 winning entries. The only other member to challenge his supremacy was Stephen Weatherall who, in Ted’s absence, eagerly agreed to share the prize - a plentiful supply of fresh cream buns kindly donated by Knott’s Bakery – definitely another example of the Best of Ards! Ards Borough Council Visitors Centre also supplied a range of items and booklets and we are delighted to be able to show some more unusual views of Ards. Wednesday 4th December - Practical Night - Bokeh, Christmas Lights etc. For more information visit our website - www.ardscameraclub.co.uk,our Facebook page - www.facebook.com/cameraclubards or send an email to the club email - ardscameraclub@yahoo.co.uk. On Friday 15th November Ards Camera Club welcomed a fellow member to share his experience since becoming a professional photographer. Paul Taylor explained how he started out in Equestrian Photography along with his wife Alannah and how his background in IT helped them develop a unique service. They now run a successful photography business (A.P. Photography - www.apfotos.co.uk) which specialises in the needs of the world of show jumping and eventing. He spoke about his collection of high specification equipment and the limits and advantages in different situations and also gave tips on selling your photographs online. Members were treated to a tour of his specially adapted trailer containing printers, touch screen computers and even a sofa and microwave! They are a familiar sight both locally at Ardnacashel Equestrian Centre and further afield. Members agreed that it was inspirational to hear how they had started from scratch and built up such expertise and knowledge and the talk was greatly appreciated. For more information visit our website - www.ardscameraclub.co.uk, our Facebook page - www.facebook.com/cameraclubards or send an email to the club email - ardscameraclub@yahoo.co.uk. On Friday 8th November Ards Camera Club, in partnership with the Northern Ireland Photographic Association (NIPA), hosted the annual Roy Finlay Memorial Natural History competition in Castle Espie. An exceptionally high standard of prints and projected images were displayed. Brian McKenna gave us a guided tour to the amazing world of Natural History photography through subjects as diverse a mushrooms, moose, zebras, hornets, bison, blackbirds and the ever active damselfly. Josie Devlin from Dungannon-Cookstown Camera Club won first place with her print, “Got-Ya” and "Fox, Yellowstone" by Bob Given, Catchlight Camera Club was judged best projected image. All the winning prints can be viewed on the NIPA website and Facebook page. We also warmly congratulate Ards Camera Club member Ted McKee who presented two commended images “Emerging Six-Spot Burnet Moth” and "Red Squirrel" and one highly commended - "Common Blue". Friday 15th: Paul Taylor - Equestrian Photography. Wednesday 20th: Bubble photography and Harris shutter effect. Lee Boyd, a well know local artist provided a very different yet still familiar perspective on Portraiture on Friday 4th November at Ards Camera Club. He told members about his winding route to where he finds himself today - in a Pod at Queen's Promenade on Bangor Seafront as part of the very successful Project 24. He showed a selection of his beautiful drawings and paintings and there were audible gasps when the members viewed some which appeared so perfect they were like photographs. He provided a very interesting explanation of how he approached a drawing, the tools of his trade and how he shaped each piece until he got the result he was looking for. The similarities to how many of us approach photography was notable. I predict a rush to see his wider selection of work in the Pod. Chronicle readers may remember Lee's work as part of the Manimal Exhibition in the Sunburst Gallery in March this year. 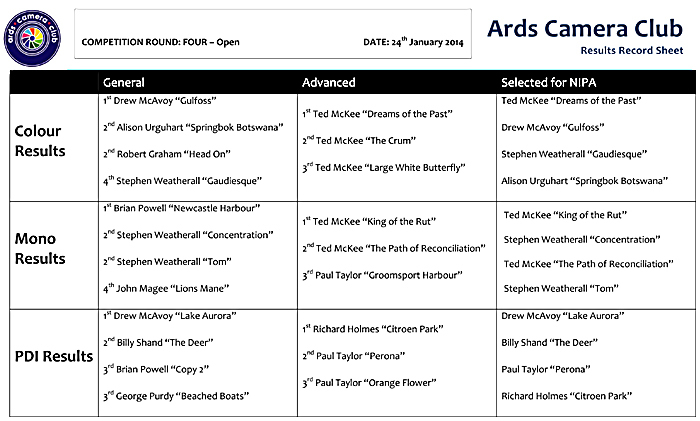 This Friday is a highlight in the Ards Camera Club year as we host the Roy Finlay Memorial Natural History Competition at Castle Espie for the Northern Ireland Photographic Association (NIPA). The subject of the photographs may be any natural object or organism in the wild, unrestrained and unconfined. This very successful evening attracts photographers and natural history lovers from across Northern Ireland and visitors are always welcome. 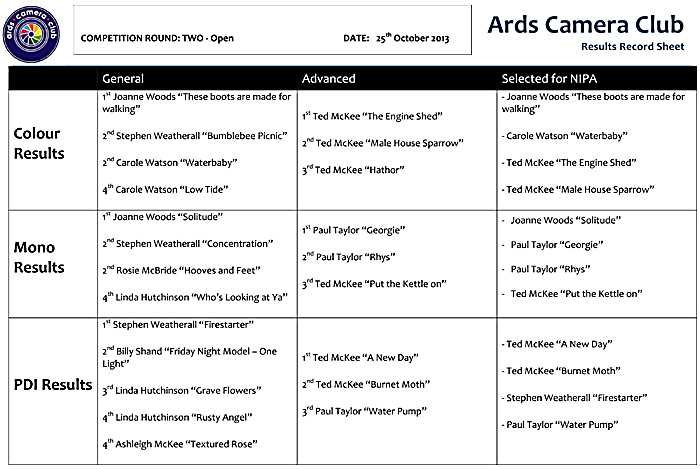 Friday 25th October was competition night at Ards Camera Club. This was the second NIPA competition of the year and as usual a high standard of prints was produced. Special congratulations to Joanne Woods who won both General print rounds, Stephen Wheatherall won the General PDI round, Paul Taylor won Advanced Mono and Ted McKee won both Advanced Colour and Advanced PDI. Full details and some of the winning pictures are available on the club website or Facebook page. The previous week Mark Overell introduced us to Lightroom and his talk was highly praised by all present with one member quoted as saying he was "the best speaker we've had in long time". Fortunately he will be returning in January to talk again. Friday 1st: Lee Boyd - An artist's approach to portraiture. Wednesday 6th: Challenge night - Splash photography. On Friday 11th October Raymond Hughes spoke at Ards Camera Club on the subject of "Putting together your first Audio Visual". He shared lots knowledge and tips which he has picked up over his many years of experience and spoke about the elusive "third image" - the image formed when pausing while cross-fading between two images. By not only showing his own work but also some work by other photographers, Raymond was able to show us a multitude of different styles of audio visual allowing everyone present to leave with at least one favourite in mind that they would like to try and recreate themselves. After such an excellent talk it's safe to say we'll see some Ards Camera Club members competing in audio visual competitions in the near future. Friday 18th: Mark Overell - Beginner's guide to Lightroom. Wednesday 23rd: Adding special effects. Last Friday Ards Camera Club welcomed Mark Allen to the club on the subject of travel photography. We were treated to lots of short slideshows of pictures he had taken all over the world from places as far away as New Zealand to some less exotic, closer to home, places like the Scottish Highlands. He also shared some helpful tips on creating audio visuals which will hopefully come in handy for Raymond Hughes' talk this week. Friday 11th: Raymond Hughes - Putting together your first audio visual. Wednesday 16th: Night and low-light photography. On Friday 20th September Ards Camera Club welcomed Martin Courtney, AIPF who shared some tips on creating panels and using these panels to claim a Licentiateship from the Irish Photographic Federation(LIPF). He allowed members to show ten of their best photos and he advised them on which ones worked well on a panel and gave advice on the placing of photographs within the panel. Ards Camera Club's own Valerie McKee has just recently become a Licentiate of this Federation and was formally congratulated on the night. Martin was not just there to talk about panels, though. He spent the second half of the night describing how to use Nik software to enhance your photographs. He finished by showing us a very quick, but effective, technique in which he turned a simple picture of a flower into a work of art with just a few clicks. 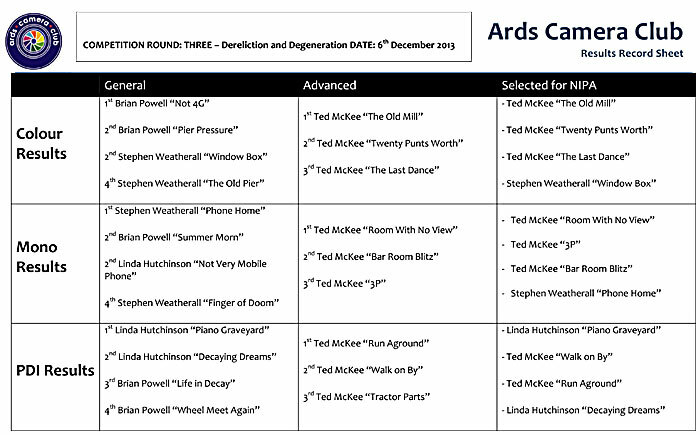 Friday 27th - Our first competition, judged by John Miskelly, LBIPP, ARPS. Category - Open. Wednesday 2nd - Making and using a lightbox. On Friday 13th September 2013 the Committee and members of Ards Camera Club welcomed Ross McKelvey, MPAGB, ARPS, BPE3 of Catchlight Camera Club as their first guest speaker of the new Club season, on the subject of Mastering Photoshop. Ross is an accomplished photographer who has achieved local and international acclaim for the quality of his images. After being welcomed to our meeting by our Vice Chair Patricia Mackey, Ross was soon into his stride with the full attention of the audience, all keen to learn. Beginning with a rather bland and lifeless image of an old boat on a shore, Ross explained the finer points of developing a digital image and soon we learned how to add contrast and bring the subject alive. Then continuing on with adjustments for portraiture and fielding questions from the gathered photographers, Ross demonstrated step by step methods and shared his hints and tips for improving on a wide range of photographic topics. Armed with all this knowledge there should be nothing stopping Ards Camera Club from having a bumper photographic season in 2013/14! Friday 20th Sept - IPF panels and processing using Nik software, Martin Courtney, AIPF. Wednesday 25th Sept - Using software to create and enhance your black and white photographs. 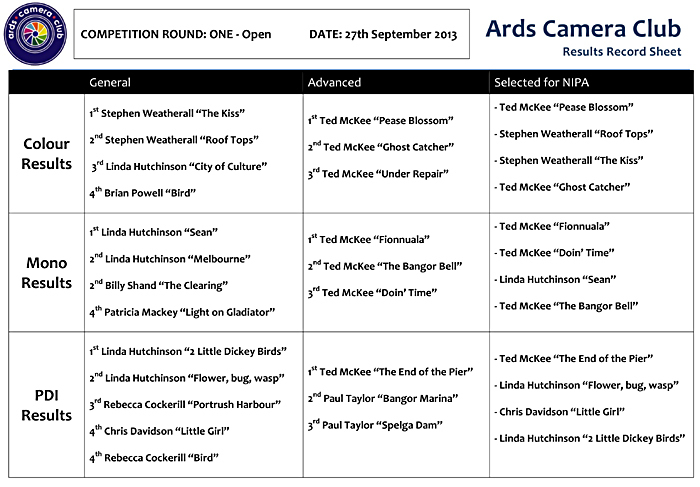 Friday 27th Sept - Our first competition of the season, judged by John Miskelly, LBIPP, ARPS. Category - Open. Facebook page - www.facebook.com/cameraclubards or send an email to the club email - ardscameraclub@yahoo.co.uk. This week at Ards Camera Club we had our first meeting of the season. After welcoming the club back the chairperson talked briefly about the programme, which has been designed to have something for people of all abilities and interests. It is available for viewing on the club website. She praised the great turnout and welcomed the many new faces. We were then treated to an excellent slideshow of members' photos from over the summer holidays. Friday 13th September - An introduction to Photoshop, Ross McKelvey ARPS, MPAGB, BPE3*. Wednesday 18th September - Practical night for black and white photography. Friday 20th September - IPF panels and processing using Nik software, Martin Courtney, AIPF. After a great summer with outings to places all over Northern Ireland the club will meet this Friday (6th September) at 7.45pm. Our first night will consist of a slideshow of images submitted by members of their summer holidays and everybody will have an opportunity to say a few words about their images if they so desire. Ards Camera Club prides itself on being a welcoming environment for all ages and abilities; we look forward to meeting any new members who are thinking of joining. The programme for the coming year is now on the website so feel free to check it out. Printed versions will be available on Friday night.